To organize means to arrange and give form to something. Parties, trade unions, the army, the Church, the State and the League of Nations are organizations. What, basically, is an organization? Have they always existed in their current forms? The whole world knows the answer is no. Among nomadic peoples they were different from those of the Middle Ages, centuries later, with that era’s feudal guilds and serfs. Germany, then fragmented into dozens of principalities, duchies, free cities, etc., had a form of organization unlike that later assumed by the German Reich. Nor should this be surprising. The external forms of an epoch are not simple wrappings which can be donned and shed at will. So, what we must confront today, in the form of a trust or a large city, just like the organization of a city registrar’s office or a local commission for the poor, is as much connected to the general situation as are the branches of a tree or its trunk to its roots. They form a whole. The organization is therefore a particular construct which possesses precise foundations. Just as skin takes different forms, and is smooth or wrinkled depending on the general condition of the body, a change in an organization’s foundations brings in its wake a change in the organization. Relations of production and economic relations constitute the foundation of man’s social relations; it is upon them that man’s way of producing what he needs depends. Capitalism is the modern form of production. Thus, the current form of organization is inseparable from the existence of capitalism itself, it is its result. Naturally, it is, like capitalism, subject to change: it ceaselessly undergoes metabolism, it grows, ages, dies and is reborn. An historical and revolutionary process unfolds. To be born, a new organization must emerge from, by means of an often very painful evolution, the upheavals and convulsions of which the old organization is still capable. The way in which the combatants conceive of this genesis naturally plays a decisive role in this process. One could all the more easily demolish the old organization and make room for the new one if one knows where the explosives must be placed. At present, the modern State represents the most advanced and most powerful expression of the capitalist system. Will it, or will it not, achieve its principal goal, that is, a world economic syndicate and the League of Nations? This depends on the struggle, the resistance, and the victory of the world proletariat, and on the stages traversed by the latter on its road to victory. For the proletariat, the capitalist State is the representative of the ruling class. It protects the private economy and private property. It is the executioner of the exploited. Its justice is class justice. Its organization and administration (trusts, trade unions, bureaucracy, militarism, parliamentarism, education via school textbooks, etc.) inhibit and repress the proletariat. They allow a restricted number of “guarantors”, assisted by their intellectual slaves, to govern an immense majority of subjects. They reduce the proletarians to the status of cogs in a machine. On top: leaders, blessed by the gods and untouchable, then the administrators who depend entirely upon them, and at the bottom, below all, the masses, dispossessed of rights, to whom some crumbs are thrown or who are fitted with the bridle and the bit: whether they receive crumbs or the bridle depends upon the ease with which it is thought that the “beast” can be pacified. The parliament is a link in the chain of the organization, and one of the forms of expression, of the capitalist State. Parliamentarism is one of the most typical forms of activity in the capitalist world, that is, a world of exploited and exploiters, a world of political-economic inequality, a world of class struggle. Parliamentarism designates not just the occupations to which the “official” representative institution is devoted, which today is no more than a business office for capitalism, a façade behind which the real business is conducted and a safety-valve of capitalism, but it is above all a symbol of capitalism. It is the expression of the being, the structure, the basic constitution of capital, of its tactics and its methods in the current period. The form assumed by political parties is bound to parliamentarism. So much so that the parties have precisely the character of capitalist organizations and are therefore constructed according to the following principle: leader and masses; as the leader over the masses, the organization goes from the top down. The leader commands, the masses obey. Above, a leader or a group of rulers; below, an army of the ruled, a few foxes and millions of donkeys. It is the “Simon Says” principle. The masses constitute the object of politics, an object which the “leaders” manipulate in accordance with their needs. The instrument of such a party is tactics, or more precisely, the tactics of the capitalist businessman, pure fraud. The leader is the businessman, the party is his property. The neighboring businessman is his competitor. These tactics, the ever-more-refined ways and means of capitalist business practice, make for success. They stop at nothing. To be a party man means: to enforce spiritual narrow-mindedness, to practice charlatanry, to stifle what is human in man. The unequal development of capitalism in the various countries, the competition between nations, even between racial and cultural communities, and, since the second half of the 19th century, the organized combat, defensive and offensive, becoming more noticeable every day, of the oppressed proletarian class, temporarily prevent capitalism, as a political-economic system, from attaining its ultimate possibility of expression, i.e., centralized rule over the world thanks to a capitalist world economic syndicate.1 This era, the second half of the 19th century, in which the proletariat acquired consciousness of itself as a class by comprehending the capitalist process and in which, on the other hand, instinctive consciousness led to its comprehension of, that is, to an understanding of the necessity of, the class struggle, of proletarian solidarity, and of international bonds, whose goal is a classless society - this era is the one in which modern communism was born. But since capitalism was not yet exhausted and the proletariat had not yet formed a mass conscious of belonging to the same class, and both continued to develop within one and the same process, it is clear that proletarian organization could not be born all at once, and especially prior to the political victory of the hitherto oppressed class, an organization which would have—unlike capitalist organization—a primarily proletarian class character and which could utilize proletarian methods of struggle derived from that character. Attempts towards this end were made, of which traces can be found in the confrontation between Marx and Bakunin. But these attempts were naturally weak, or accomplished nothing, or were distorted. Proletarian class consciousness developed very slowly (the mere number of members of the socialist organizations is of no significance) and the characteristic trait of the transitional period bridging that epoch and ours is the flood of a multitude of the exploited into the ranks of the social democratic parties and trade unions. The struggle of these organizations, as they were being carried out on capitalism’s own terrain, obviously did not require the “advocacy” of a goal, but advice concerning the road to follow and how to most advantageously utilize all the bourgeois strongholds. The trade unions’ fight for wage increases and the parliamentary struggle were political necessities in an epoch when a slogan like the unhindered right to vote could awaken and provoke revolutionary energies. But in the course of this fight, the next goal, which was “the development of proletarian class consciousness”, was lost sight of completely. The point of view according to which “the emancipation of the working class will be the task of the workers themselves”, and which made the development of the workers class consciousness the principal task which should not be forgotten for even one moment, was increasingly disregarded. The more time passed, the more the socialist organizations assumed the character and the methods of capitalist organizations. They became “organizations of leaders”, private property in the hands of those who pulled the strings and who were still under the spell of bourgeois capitalist conceptions. They became ends in themselves. The “leadership” of the class struggle was in the hands of a few individuals who were cut off from the needs of the proletariat. It was the victory of parliamentarism which necessarily led to the paralysis of the revolutionary activity of the masses. The class struggle and the revolution became the concern of a group of high-level managers. This trend has not yet come to an end. The “socialist” parties, or, more properly, the rabble of the parties, only attained their most repugnant display after the revolution of 1918. From this point of view, the old social democracy is related in a direct line of descent to the “Unified Communist Party” (VKPD) and the degree of abjectness only increases as we get closer to the VKPD. Even more clearly than the parties, the trade unions became organizations of a perfectly capitalist nature. Born in an epoch of small-scale war against employers who were not yet powerfully organized in cartels, they were originally the adequate form for proletarian combat against capitalism’s tendencies towards pauperization. In the final accounting, the trade unions form a bureaucratic organization on the margins of the world of the private economy, to which, however, its leaders are connected, as veritable permanent employees, for good and for ill. Since their existence depends upon the existence of the trade unions, they unavoidably find themselves under the pressure of circumstances; and their decision-making power is thus increased, while they are more and more hesitant to use it even in the best cases. The trade unions are organized by trades. They have increasingly deviated from the rigorous and implacable idea of the class struggle and instead content themselves with demands for better wages and working conditions for the various job categories. They have separated the employed workers from the unemployed, the young from the old, men from women. The employers, united in ever more powerful trusts, put them on the defensive, despite their decline into an increasingly more pronounced reformism. They have, whenever possible, prevented important strikes. The general strike and the mass strike were preventatively denigrated as general nonsense. In effect, such strikes would annihilate the trade unions, as well as the existence of their bureaucratic leadership. The decline which has overtaken the capitalist period also affects its forms of organization. Our descriptions of the party and the trade union clearly show us that their organizational forms are, or have become, capitalistic. These organizational forms are economically based upon the profit economy and tend to assume a form developed within the private economy: State capitalism. These forms, from the ideological point of view (that is, as a spiritual reflection of their economic foundations), are the origins of the cults of personality, the “leader” and authority, and the growth of individualism and egoism. The formation and growth of the proletarian class naturally brings about forms of organization and expression which accord with the development of that class. This outcome is obviously not produced unless the proletarians have a perfectly-developed consciousness of forming a class whose own interests are opposed to those of capitalism. These forms of organization and expression are not created overnight and are not perfectly pure a priori constructions; they evolve thanks to the progress of intellectual understanding and the influx of increasingly crucial masses of people. They will not attain complete maturity unless the proletarian base exists, hence until after the disappearance of the private economy and the profit economy, which will have been replaced by a communitarian proletarian economy adapted to need. It is easy to understand that there will be an organization unlike capitalist organization when the proletariat will have become a society, a total collective owner of all the means of production (mines, factories, etc. ), of everything which had previously been “property”, when everything belongs to everyone in common. But before reaching that point, the proletariat creates—and does so all the more effectively the more conscious it is of its forming a class—forms of expression, organs, which incarnate class consciousness, social consciousness, the consciousness of mutual solidarity. When this form of organization becomes a revolutionary process, it is called council organization. This organization develops by way of an uninterrupted struggle against capitalist forms. It disrupts them, smashes them to pieces, it causes them to explode. In this new organization, leaders and masses will relate to one another differently. The current will not flow from above downwards, but first of all from below upwards. Then one will be able to witness the living interpenetration of the united whole. The organization of the councils will be the mortal enemy of all bureaucratism, of all parliamentarism, of all partnerships with capital. It will be totally based on the masses who are conscious of constituting a class. The organization of the councils will therefore—as long as the workers fight for it—permit liberation from the capitalist yoke, and particularly from the yoke of the bourgeois ideological sphere. In its future is incarnated the progressive evolution of the self-consciousness of the proletariat, the will to transplant the class consciousness of the proletarians into reality and to give it a real expression. The intensity of the fight for this organization of councils allows one to exactly measure to what extent the proletariat conceives of itself as a class and how determined it is to impose its will. It is equally obvious that the workers councils are not just empty words but are completely the expression of the new proletarian organization. It could happen that, while developing, authentic councils are corrupted and crystallize into a new bureaucracy. It will then be necessary to combat them as vigorously as the capitalist organizations. But the course of development will not halt, and the proletariat will not stop, until it has given the new organization—the council system—its historically attainable expression in the classless society which lies beyond the “dictatorship of the proletariat”. The Factory Organization is the preliminary step towards the formation of the specifically proletarian organization, or organization in councils. The outlines of such an organization have already been created on various occasions. But only the revolution clearly left its mark upon the Factory Organizations which then could be considered to be the real offspring of the most lucid proletarian class consciousness. They were born because they were the class weapons of the workers combat. The old organizations, especially the trade unions, could not and did not want to play that role. 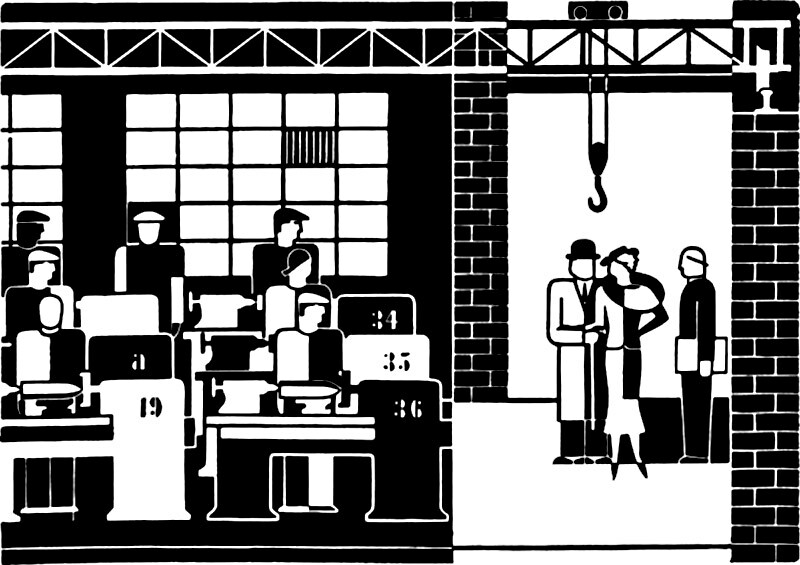 The Factory Organizations are not, then, artificial. Nor or they the products of confusion. The class consciousness of the proletariat breaks out in them with all its power due to the economic relations and the clear understanding of specific conditions. They are new institutions which grow from the bottom up, expand, shatter all that is old, destroy and uproot it, and convert social life and thought into realities. No one can deny that we are living in an epoch where the capitalist world is on its last legs. Communist production is the only possible way out. Now is the time to find the way by which the revolution can be most rapidly and successfully brought to a conclusion. It is not enough to take political power (the proletarians took political power in 1918)—one must hold on to it. The most urgent task facing the proletarians—who are still largely imbued with capitalist ideology—is to discover, against the power of capital in Western Europe, against the power of its organization (State, militarism, parliamentarism, management, bureaucracy, schooling, hierarchy), the possible ways to definitively destroy these old forms. But one does not build by satisfying oneself with destruction. That which is content to criticize, to reject, without being able to offer positive proposals, finally finds a place within the bourgeois world. The bourgeois intellectuals also make a harsh critique of their world. But scorn, jokes and derision alone are not enough to allow the growth of proletarian class consciousness. The struggle against centralism and blind obedience, against leaders and trade union bonzes, cannot succeed, that is, it will not allow the proletarian revolution to move forward, if it is content to fight them to the death and to smash them to pieces; it is necessary that purely proletarian forms should arise (as a prelude to the organization of the councils) and that these new forms should uproot the old. The Factory Organization is the expression of this demand. If the workers desire their definitive liberation as a class and not just advantages for a few cliques and social strata, it is necessary for them to create forms which are completely the work of their own class rather than the products of a few “leaders”. They must create forms in which autonomous thought and action are not just words, but realities. Such forms, having issued from their deepest being, that is, having been born from their proletarian class will, shall stand totally opposed to all forms which are dependent on capitalism, to a greater or lesser degree. While they cannot be absolutely “pure”, because we are living in a period of transition, their orientation must be absolute and always clear: their corollary must be proletarian solidarity, which for this same reason becomes an imperious necessity. The Factory Organizations are above all organizations of class struggle. United in the AAUD (General Workers Union), they comprise neither a political party nor a trade union. These two terms are employed in accordance with the meanings they have had up until now, that is, referring to institutions whose nature we can all understand with reference to today’s parties and trade unions. Within these organizations the proletariat begins to consciously organize itself for the complete demolition of the old society and for its unification as a class. In the Factory Organizations the masses will be united by the consciousness of their class solidarity, of their proletarian class solidarity: they constitute the location where the unification of the proletariat is organically prepared (that is, like a natural process, in accordance with the circumstances). The Factory Organization is the beginning of the communist future and, as the backbone of the factory councils, will become the basis of the future communist society, of the classless society. Classless society means communitarian economy and all-encompassing forms of social expression. It means the total unification of the economic base. At first, everyone will receive as much as possible. Later, according to their needs. Everyone will have to work as much as is necessary for any given situation. The Factory Organizations, in a profusion of living elements, are grouped together in the General Workers Union (AAUD). This association is not an arbitrary amalgam of different groups, each separate from the other and existing independently, but responds to an internal need. As the council idea develops as an expression of the class will of the proletarians, the various Factory Organizations must grow along with the latter. In effect, born in pieces, they only find their culmination in the vast current of the general evolution which leads to the proletarian form of organization. Just as streams end up forming a river, they will necessarily unite. Such an association, in conformance with the council idea, emerging from the rank and file, is wanted and needed by the proletarian class. To fight as an exploited class unites, creates and provides a form for the social bond, for proletarian solidarity, and for class solidarity, which is not expressed in words but in deeds. As an organization of the whole, as a beginning of the organization of the councils, the AAUD, naturally, is never complete. New Factory Organizations will flow into it, and more than once mud and silt will spread through it, instead of clear water. It is a natural process. It will be obliged to ceaselessly fight for its purity. The fight which the AAUD must lead is the class struggle in its purest form. It is already carrying on part of this fight by constituting its own organization in accordance with the proletarian idea of the councils, in opposition to capitalist forms of organization. It strives ceaselessly and in every way within the production process to realize this idea in an ever clearer and purer form. Its very existence alone is already a threat to all the capitalist forces. It provides an example of the progressive development and crystallization of proletarian class consciousness, and therefore compels the whole proletariat to take a stand. The organization’s development in this direction will increasingly demote to a secondary level the conflict between what are known as centralism and federalism. From the AAUD’s point of view, the polemic over these two principles, these two forms of organization, will become a dispute of empty words. Obviously, these two terms must be understood according to the meanings they have possessed until now, and not according to a new meaning foisted upon them. By centralism we understand the form which, through the will of a minority, bridles and enslaves the masses. For the AAUD, it is a demon which must be extirpated. It is antisocial. Federalism is the opponent of centralism, but an opponent operating on the basis of the same economic system. It is the sovereignty, the stubborn obstinacy of the individual (or the workshop, or the region, or the nation) understood on its own terms. It is equally antisocial and must be fought just as vigorously. These two forms progressively evolved over centuries past. Federalism was victorious in the Middle Ages, while centralism prevailed during the period of advanced capitalism. Sympathy for federalism is based simply on the fact that, by seeing it as the negation of centralism, one assumes that it will bring freedom and paradise. This desire for federalism leads to a caricature of autonomy (the right to self-determination). So it is thought that when one attributes autonomy in all domains to each region, to each place (one might also say, to each person), one is acting in a social and a proletarian way. In fact, this accomplishes nothing except to abolish the empire so as to replace it with a number of small principalities. Petty kinglets (local bosses) arise everywhere who themselves assume rule over a fraction of the membership in a centralized manner, as if it was their own private property: from this, fragmentation and general collapse ensues. Centralism and federalism are both bourgeois forms of expression. Centralism is more typically big bourgeois, while federalism is more petit-bourgeois. Both are anti-proletarian and stand in the way of the purification of the class struggle. The proletariat knows that it cannot defeat capital unless it closes ranks. The more the consolidation of the council system advances, the greater will be the gains registered by the proletariat’s unity in both intensity and scope. Within this unity, with its control from below, with its unleashing of all proletarian forces and potentials, with its strong bonds connecting the leaders to the masses, all conflict will then be absorbed, the development of class consciousness and the development of absolute social affinity will become realities. First spiritually, and then later in the communitarian economy. It will be easily understood that all of this is yet in the process of becoming and that the road which the AAUD must follow before reaching its goal is still a long one, and that many errors will yet be committed (in particular, the meddling interference of certain groups or individuals--which is quite understandable as a result of the disorder caused by the confusion of secondary tasks); this will provide the “centralists” and the “federalists”, who are for the most part good fighters, although with confused ideas, with the continually renewed occasion for protesting against dictatorship or to demand more dictatorship. But this must not prevent us from following the correct road; which is to say that the proletariat, as an international class, seeks and finds, by building the council system, its increasingly more compact unity, a unity which it realizes in order to definitively vanquish capitalism and the spirit of capitalism, a unity which will later issue into its conclusion as the classless society. The very structure of the AAUD, as clearly manifested in the organization’s statutes, itself engenders between masses and leaders relations unlike those prevailing in organizations of the capitalist type. If, in the latter, the proletarians are the playthings of all variety of politicians, in the AAUD they will increasingly become the masters of their own fates, of the fate of their class. The theory according to which the real emancipation of the laboring class can only be accomplished by the workers themselves becomes a material force. The concept of “masses” acquires a different meaning than it has in the capitalist system. In the minds of the supporters of the private economy, the word “masses” is always synonymous with corpse, with an object which is manipulated at will. It is considered as the “property” of certain men, offices and cliques. In proletarian thought, on the other hand, the masses do not constitute an incoherent collection of confused egos, but instead denotes the proletariat to the extent that its class consciousness allows it to indissolubly unite social thought and will. Such masses can only arise through their own increasing activity and ceaseless organizational efforts, first in the fight against capital, building their own organization; then, in their constant collaboration in the production process. What we have just said expresses the current understanding of the word “leader” from the proletarian point of view. This leader must be intimately connected to the class-conscious masses. He will represent and organize the life and thought of the masses, who will in turn transmit their own enthusiasm to him. He must not fight like a businessman does, for his property, for his people, for his nation, but as an integral part of the vast proletarian masses who feel, who think, and who desire, and who exist throughout the entire world. He must not fight while saying, “I want to transform the proletarian movement into my movement, the revolution is my affair, it is me whom you must follow”; all of these sentiments correspond to private capitalism, they comprise part of bourgeois ideology. As long as it has to fight, the AAUD will therefore not reject leaders a priori, which would be equivalent to rejecting all intelligence, all ability, all resolute will. If it did so it would no longer be a socialist organization but a military and bourgeois prison in which, fatally leveled, the human being would be mistaken for the product of a machine. It would also be utopian, since the struggle has just begun. This position, however, will burden the proletarian leaders with the greatest responsibility. The only requirement of the organization and the system will be that all its officers are subjected to the strictest control. The council organization is to be understood in this sense. It carries out a merciless battle against one-man dictatorship, against ruling cliques and organized power centers which have separated from the needs and living conditions of the proletarian masses and which use the methods of capitalist social climbers. It most violently takes its stand against the intellectuals, that is, against those persons who use their higher education to transform the proletariat into a plaything of their own conceptions and interests. The AAUD is the inveterate enemy of the capitalist bourgeoisie from both the internal and external points of view. It thus naturally finds itself on the terrain of the “dictatorship of the proletariat”. Its subsequent goal will be to fight for the realization of this dictatorship. Such a dictatorship means that in the struggle for the communist and classless society there is no compromise of any kind between exploiters and exploited, between capital and labor. To attain this goal, it is absolutely necessary for the proletariat to have all decision-making power over all of society’s political and economic institutions, via the council organization. The dictatorship will last until the old powers have disappeared. The AAUD stigmatizes as much as it can the imposture of bourgeois democracy, which takes for granted an a priori economic inequality. It would be a waste of time to dilate upon the nature of that kind of democracy (of the ballot-box) to proletarians who have had to endure its indelible effects since August 1914. Every democracy of that kind is a dictatorship of the owners. At a time when all of the preconditions for the proletarian seizure of power are present, that is, when capitalism’s survival is no longer possible except by way of an unprecedented increase of exploitation, leading to the deaths of millions upon millions of proletarians, the exploited, in ever-increasing numbers, are carrying out a revolutionary struggle against “democracy” and will not rest until capital lies prostrate at their feet. One cannot expect a voluntary abdication, except perhaps one which is only for appearance’s sake (as in Hungary, for example). Once the proletariat becomes the ruling class and while communism is being built, it will have to use every means to demolish every counterrevolutionary movement; it will have to use violence. Otherwise, it would commit suicide. The dictatorship of the proletariat is irreconcilable with the freedom of the bourgeoisie. To deny this would be either the result of a lack of understanding, the chatter of priests, utopia, or a direct or indirect defense of the counterrevolution. But the AAUD’s clear profession of faith in favor of the “dictatorship of the proletariat” consists equally of the fundamental rejection of any kind of collaboration with capital. It is the profession of faith in favor of the proletarian struggle relying on its own methods. The politics, or, to put it another way, the struggle of such an organization, has an a priori proletarian class character. This means above all rejecting any form of parliamentarism regardless of its type. It should also be said, expressed negatively, that all parliamentarism leads to the sabotage of the proletarian revolution as soon as such Factory Organizations come into existence. Furthermore, the AAUD’s battle is entirely international. The proletariat, as a class, acts resolutely only as a result of its international, unified character. The internationalist point of view stands in the forefront. The AAUD’s goal is the international communitarian economy and, finally, humanity as a classless society. The form taken by its struggle is naturally linked to a certain extent to the conditions in each country. It will, from the very start, incessantly strive to create links between and to unite the revolutionary councils of the various countries. Published in English in a collection of texts as appendix to Dauvé and Authier’s The Communist Left in Germany 1918-1921. Online version taken from the Collective Action Notes website. 1. Prior to and during the war, revolutionaries were debating whether a single world capitalist State was in the offing. The majority arrived at the conclusion (correctly, in our view) that this was impossible: competition, even monopolistic competition, is the very soul of capital. Applied on the scale of a single country, this “super-imperialism” hypothesis evolved to become the theory of “State capitalism”, later elaborated by Bruno Rizzi (L’URRS, collectivisme bureaucratique, Part 1, 1939; Champ Libre, 1976. For an English translation, see The Bureaucratization of the World; London, Tavistock/New York, Free Press, 1985), and by some elements of the German Left, and, after 1945, by the journal Socialisme ou Barbarie. Concerning the latter group, see the well-documented book by P. Gottraux published by Payot (Lausanne, 1998). 2. Quoted from World Revolution and Communist Tactics. 3. This passage is taken from the Program of the KAPD. The dictatorship will last until the old powers have disappeared.